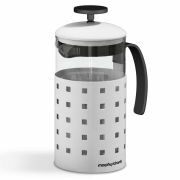 A great addition to any kitchen where high-quality hot beverages are high on the agenda, this stylish Morphy Richards Accents 8 Cup Cafetiere 8 cup is perfect for sharing a drink with your friends and family - whatever your choice of coffee. Featuring a stainless steel body, holder and lid, this kitchen wonder not only looks the part but is durable to boot! A dishwasher-safe liner makes post-use clean-ups swift and easy, and the 1000ml capacity boroscilite glass inner means you can top up all day long without having to boil the kettle again and again.Features:1000ml capacity boroscilite glass linerDishwasher safe linerStainless steel body/holder and lidSoft touch handle and plungerSteel filterColour match exterior coatingColour box packagingWarranty with RKW: 1 Year.Extended Warranty: 2 Years. Valid only if item is registered within 28 days of receiving it.